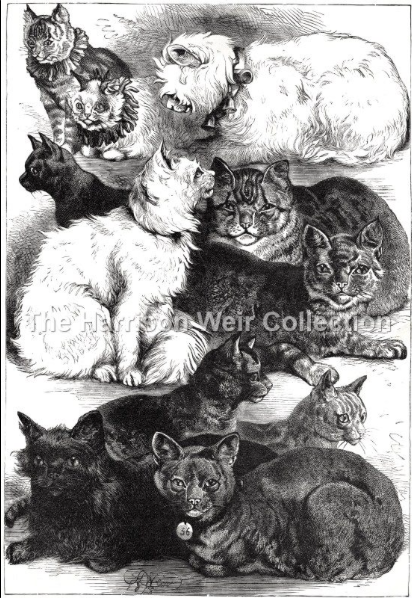 « Miss M.Livingstone's Siamese Neuters,"Togo" and "Eoin"
This iconic work by Harrison Weir is signed and dated 1873, and most likely represents examples of the winning cats from the Crystal Palace Cat Show of that year. This image comes from 'The Imperial Natural History Book' by George Routledge & Sons, published in 1884. (an extremely large format Children's book). This image is available in a high quality print form from our website in A4, A3, A2 and a giant A1 Poster size. It is a dramatic and eye catching piece. It can be found in Gallery 1 - CATS.